Turmeric is known as Indian saffron and Curcuma longa. 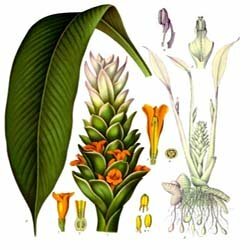 It is related to ginger and grown throughout India. It is also grown in other areas of Asia, and Africa. It is used In traditional Chinese medicine as well as Ayurvedic medicine. Indian saffron has been employed to help digestion as well as liver function, menstruation and arthritis pain relief. In the present day it is employed for conditions like heartburn, gallstones and stomach ulcers. It is also employed for cancer prevention and treatment as well as reducing inflammation. The underground stems are first dried, then taken by orally in powder, capsule form as well as liquid extracts, teas or made into paste and applied to the skin. Researchers at the Ohio State University in Columbus investigating curcumin found that curcumin demonstrated some anti-cancer effects at nearly all stages of the tumor development inside rodents. Curucumin showed the potential to kill off cancer cells as well as prevent regular cells from developing cancer. In a study in a French lab, it was concluded that curcumin had shown itself to be a strong inhibitor of cancer growth. Numerous laboratory studies concluded that curcumin may slow and prevent some forms of tumor cell growth. Animal studies done in the UK suggests that curcumin slows down adenomas growth in mice intestines. Another United States study with mice showed that curcumin slowed down breast cancer growth to the lungs. Human studies involving curcumin is in its early stages. Those who have disease of the gallbladder should not use it as a diet supplement.